‘Tis the season of giving, so this holiday season, we are slashing the price on our BlackBerry App to $1.99. That is an $8 savings for those of you doing the math. This year, we’ve received great praise for the Xobni BlackBerry App (CrackBerry, CNET, PC Magazine, BerryReview, Berryfication, BlackBerryCool) , so we wanted to make sure as many people as possible had it as we prepare to be more connected and more productive as ever in the new year. You all have been great to us, so now we thought it was our turn to return the favor. 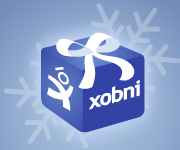 This is a limited time offer, so we encourage you all to get Xobni for BlackBerry at this great price while you can.